Mouriya is a well known steak restaurant in Kobe that serves kobe beef. During our trip to Japan, we specifically took a day trip to Kobe so we could eat authentic kobe beef. 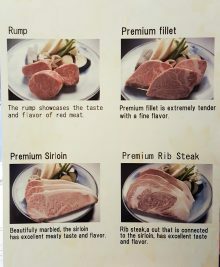 There is often confusion between kobe and wagyu beef, especially in the US where you’ll find meats labeled as American kobe, kobe-style, etc. Here is a little clarification. Wagyu beef refers to four breeds of Japanese cattle. Kobe beef is a variety of wagyu beef. It comes from a very specific strain of wagyu, Tajima-Gyu. 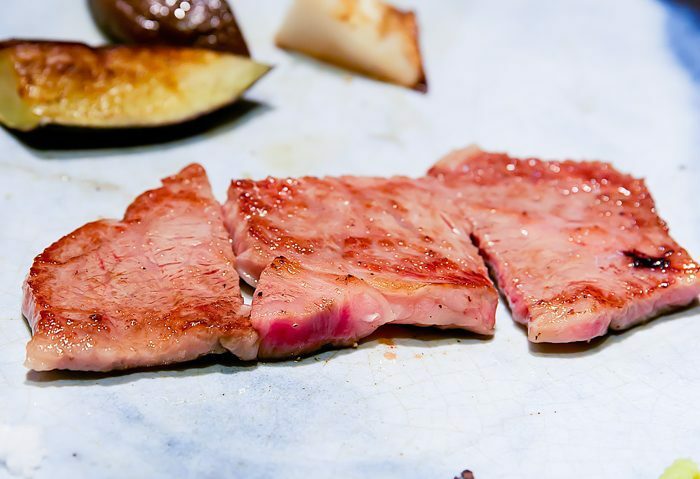 Kobe beef can only come from Hyogo prefecture (where Kobe is the capital city of). The cows are fed a special diet and go through a strict certification process. For a short while, Japanese beef was banned from being imported into the US. Even though the ban has been lifted, authentic kobe beef in the US is very hard to find and is very expensive. 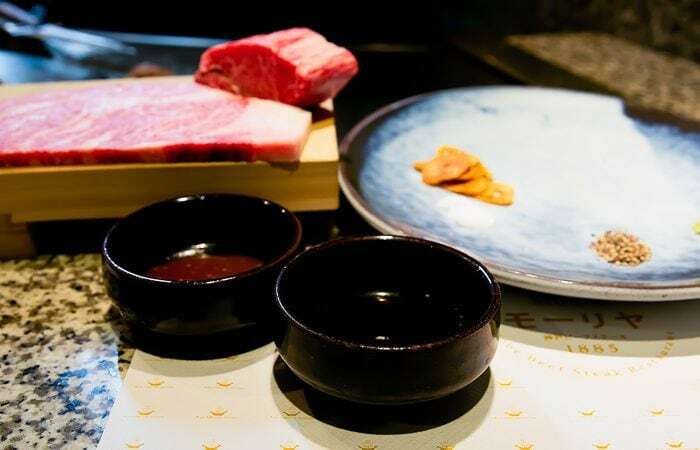 We had a small taste of a lower grade of kobe beef during our first trip to Japan, and after that taste, we knew we had to visit Kobe where we could experience the premium kobe beef at a price within our budget. 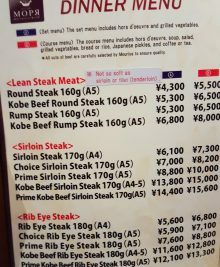 There is a large range of prices and quality of kobe beef in Kobe. 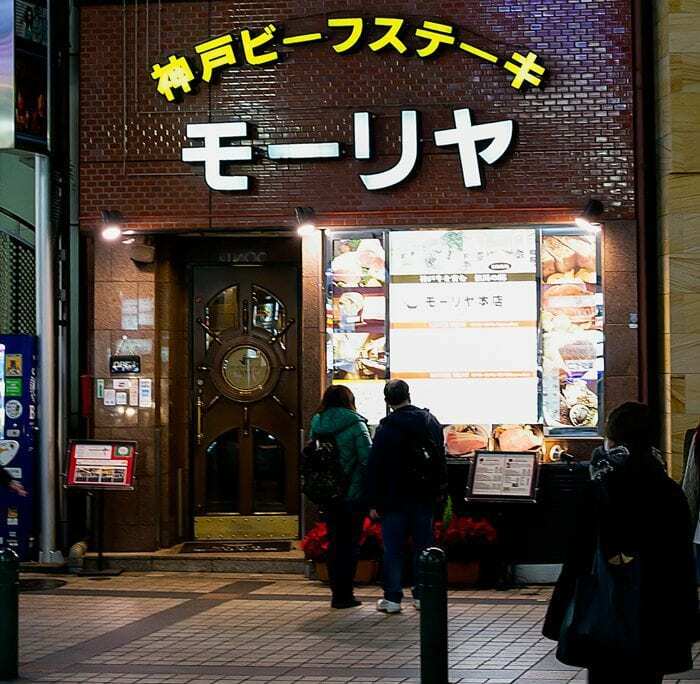 Since we’d come all this way, we decided to treat ourselves to Mouriya Honten, which was established in 1885. Mouriya actually has several branches, with Mouriya Honten being the main branch. 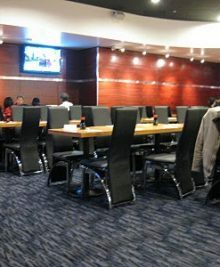 The restaurant was easy to find, just a few steps away from the train station. 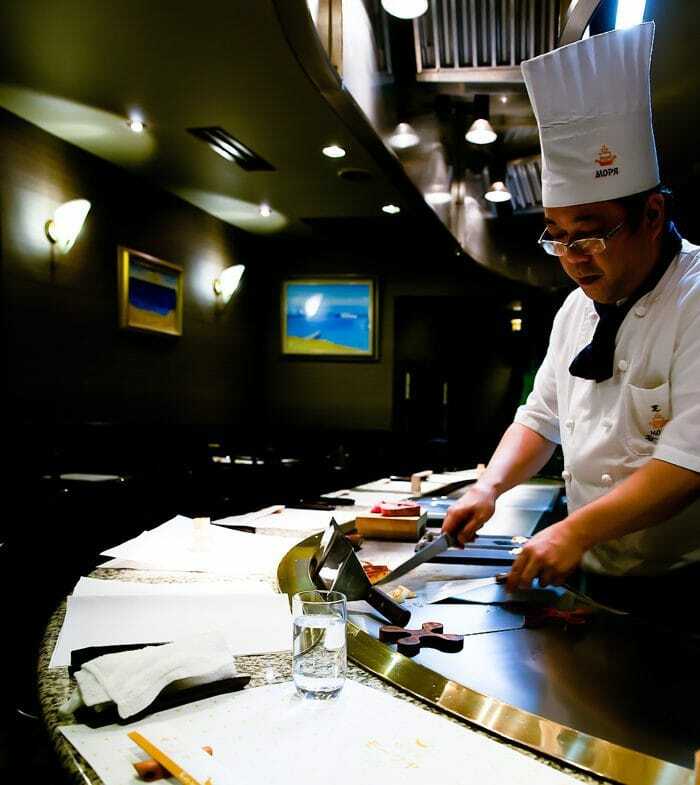 Like most of the kobe beef steak restaurants in Kobe, the beef is prepared teppanyaki-style. These were the two beef selections we made. 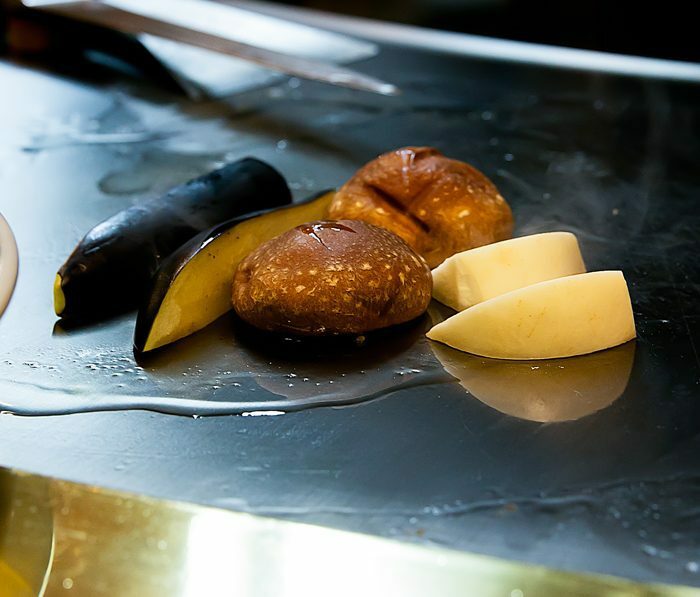 They are first presented to you on a little wooden platform and the chef offers to take a photo of you with your meat. After all the photos, they start to prepare your food. Included with dinner was one drink from a select menu. 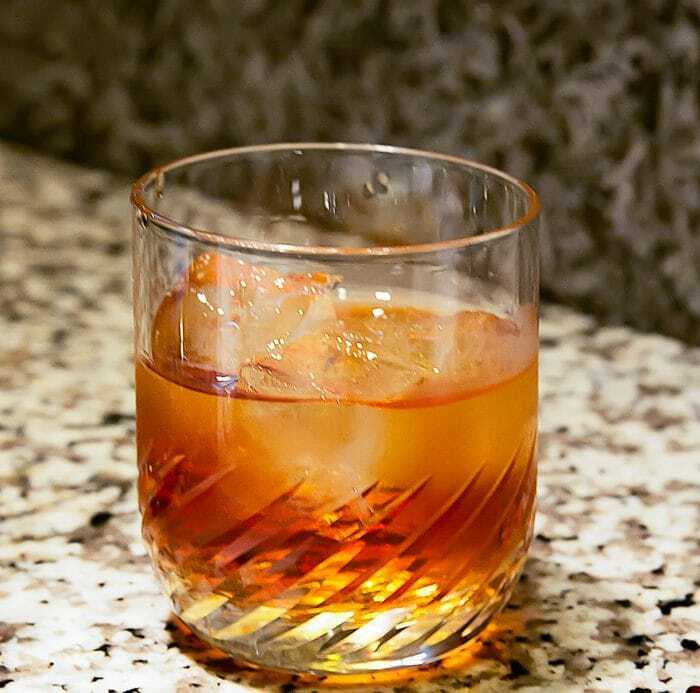 I chose plum wine because I fell in love with plum wine in Japan and was drinking it whenever it was available. Mr. K chose a red wine to compliment the steak. 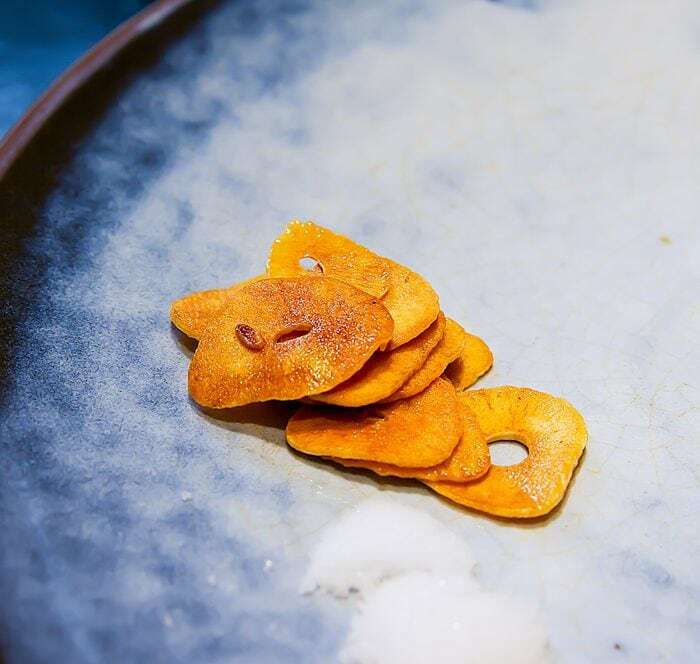 The chef took several minutes to slowly crisp up these garlic chips. 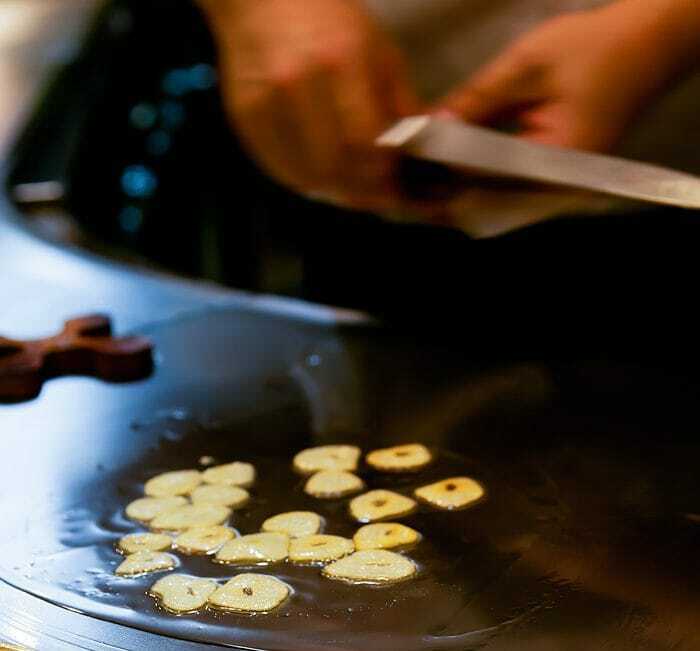 I found myself mesmerized by the meticulous cooking. These tasted like garlic potato chips, without any trace of bitterness due to the low heat cooking technique. 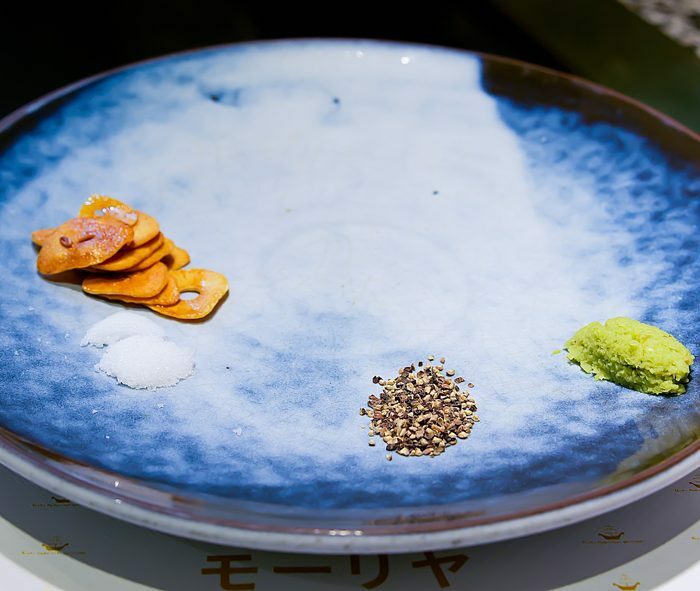 In addition to the garlic chips, you are given salt, pepper, wasabi, and a few dipping sauces to eat with your steak. 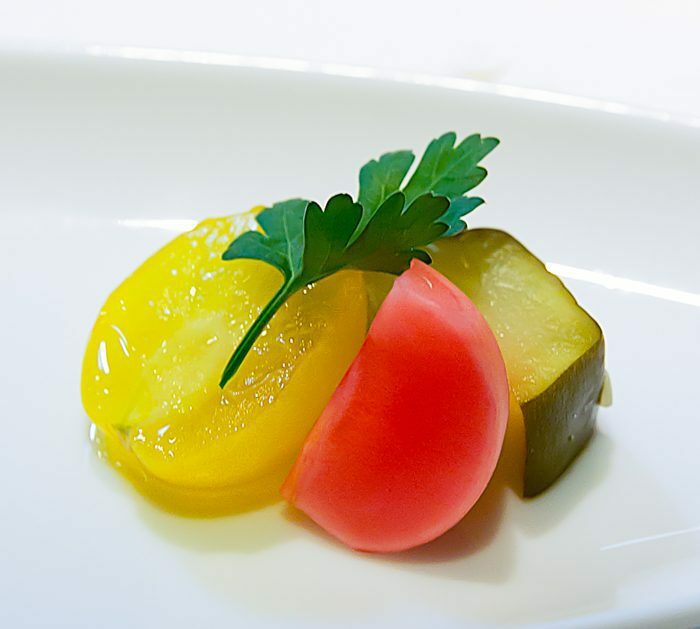 We were served a cold seafood appetizer and some pickled vegetables to start. The first steak that was prepared for us was the fillet. 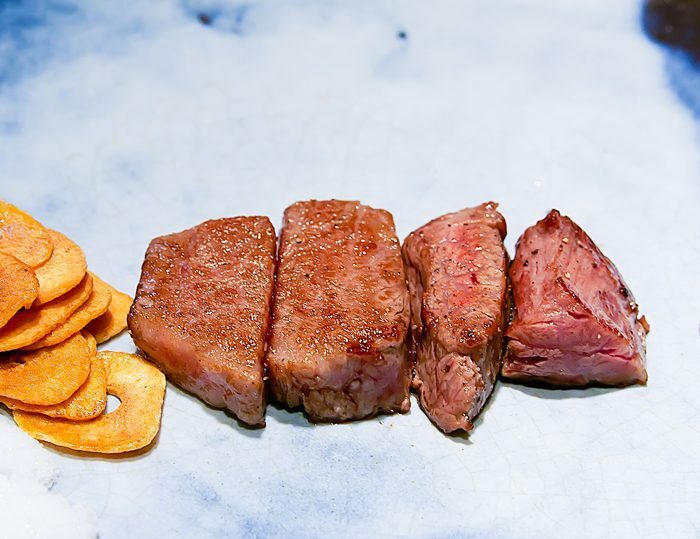 Kobe beef has a lower melting temperature than other beefs, so it can’t be cooked too long. 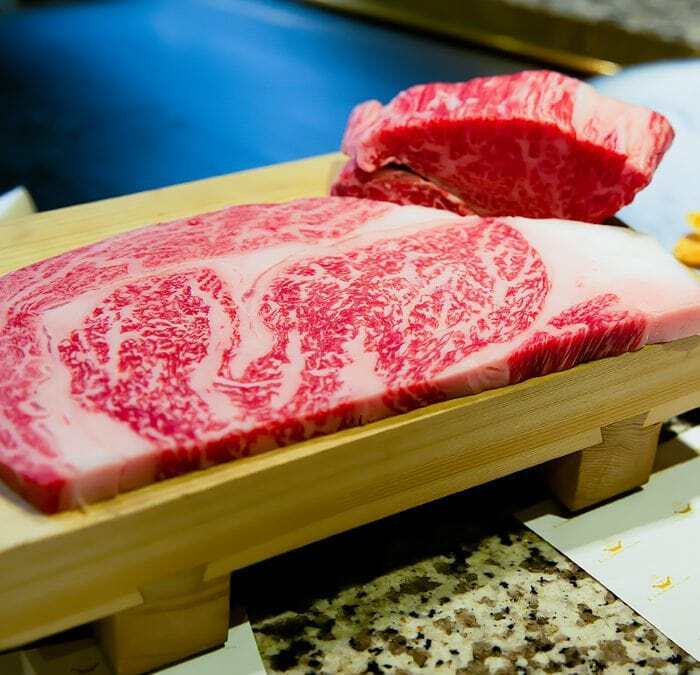 Kobe beef is known for its intense marbling. Some may think that this makes kobe beef very unhealthy. 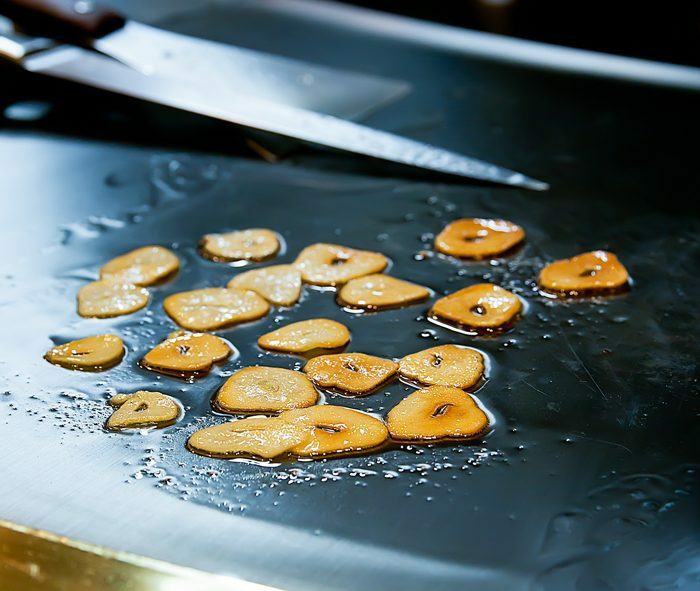 However, kobe beef actually contains more Omega-3 and Omega-6 fatty acids and unsaturated fat than regular beef. The texture of the beef was like that of softened butter. 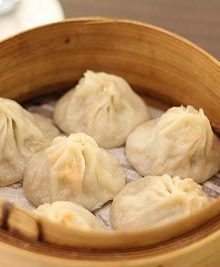 My teeth sank straight through the tender meat and it felt like it was melting away as I chewed. I was able to recognize the taste of fillet, but the flavors were so much more intense, rich and creamy. 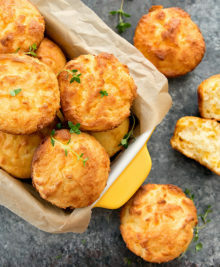 I thoroughly savored each bite. Next we were served some vegetables. 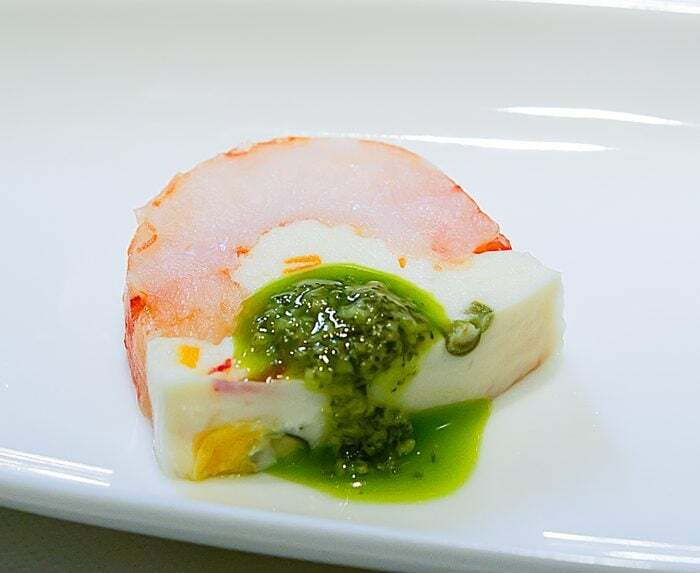 I do wish that we had started with this, rather than the fillet. The ribeye was very good, and had the same melty feeling, but the overall flavorful profile was more limited. I’m not really sure the reasoning behind starting with the best/most expensive, but we saw the chefs doing this for all the tables. It just made me wish I had saved a piece of fillet to end my meal. 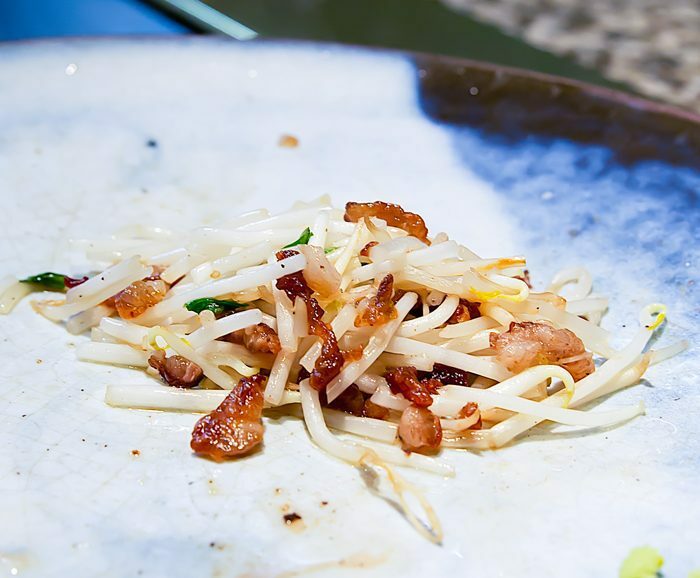 For our final bite, the chef took the fatty edges from the steaks, which he had cut off and set aside earlier and mixed it with some bean sprouts. Again, I couldn’t quite understand why we started on such a high note and ended with the undesirable pieces of the steak. However, the meal overall was still wonderful and memorable. So is all the fuss over kobe beef worth it? I think so. I’ve been very fortunate to have tasted a lot of steak, including high quality Japanese wagyu and Australian wagyu. I’ve had mixed feelings about most of the wagyu I’ve had and haven’t always felt it was worth the cost. But the kobe beef was quite a different experience. It was so unique and unlike any other beef I’ve experienced. 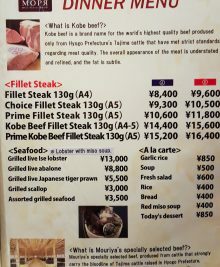 If you are in Japan, I definitely recommend making the trip to Kobe to experience kobe beef. Just writing up this post makes me want to go back. It’s not good to read this post before breakfast! That’s funny that the chefs offer to take a photo of you and the meat.